EXEDY Technics Auto Trans Frictions - Dezod Motorsports Inc - Home of the automotive performance enthusiast since 2002. Wet friction discs are used as torque transfer and braking devices in several application including automatic transmissions, torque transfer couplings and wet brakes. 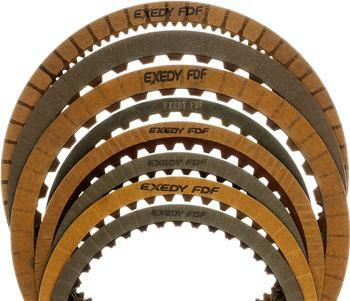 Friction material is the core competency of EXEDY: EXEDY is engaged in the advancement of state-of-the-art wet friction technology. Currently, EXEDY offers three friction material families: paper, carbon, and non-woven. EXEDY manufactures nearly 25 million plates for the OE’s worldwide, per month!